This is lesson 8 of 42. This series is currently in-progress and will have new lessons each week, visit Bethany’s author page to see the latest available. Ask if anyone can remember the 3 truths we’ve learned so far. Have the kids stand up and say the attributes of God and do the motions. Start out by reading this week’s memory verse (Micah 7:18) and then asking if anyone in the group can define the word forgive. Have someone in the group remind you in one or two sentences who needs to be forgiven (all of us) and why we all need to be forgiven (because we have all sinned and the punishment for sin is death). Then, choose a few kids from the group to act out the story while you read the text – Luke 5:17-26. You’ll need one child to be paralyzed, one to be Jesus, at least one to be the man’s friends and at least one pharisee. but, the house was full, so they climbed on the roof and lowered him into the house through the roof right at Jesus’ feet. The Pharisees started thinking and whispering to themselves wondering who Jesu thought He was because only God can forgive sins. (notice that they were thinking these things, not saying them). Jesus asked the pharisees why they were thinking these things. Then, Jesus told the man to pick up his mat and walk. Jesus healed the man to prove that He also had the authority to forgive the man’s sins. 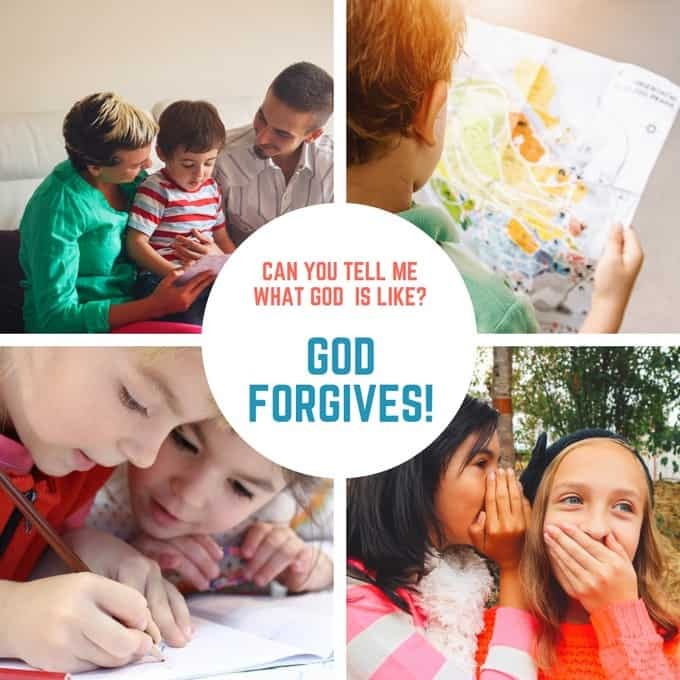 EXPLAIN: Talk with the kids about times they’ve done something wrong and asked for forgiveness or times when they’ve forgive someone else. Talk about how hard it is to forgive someone who has hurt you or upset you and get kids to give examples of times it was hard to forgive someone. Since motions & actions help kids remember, choose an action for FORGIVES. A good motion might be to act like you’re tearing up a piece of paper (imagine a judge tearing up a ruling). SAY: “This week our memory verse is Micah 7:18. This verse asks a very important question about God. “Who is like you?”…. who else pardons sin? The answer to that question is no one. There is one one else in the world who can pardon or forgive sin. Forgiveness of sin is only possible through Jesus’ death in our place. Work together as a group to make up motions for the verse using the motion for forgive that you just learned to help you remember it. Read the verse with the motions together a few times. Today’s truth about God sums up the whole story of the Bible. Knowing that God forgives sin and that He forgives through Jesus is one of the most important things we can ever know about God. When the man’s friend’s dropped him into the room with Jesus and Jesus forgave his sin, Jesus was teaching the crowd that what the man needed more than physical healing was to be healed spiritually. The Bible tells us that ever since Adam and Eve we have all sinned (Romans 3:23) and we all deserve to be punished for that sin (Romans 6:23). We are all sinners in need of forgiveness and that forgiveness is only possible through the death of Jesus in our place (Hebrews 9:22). That is the reason that Jesus came to earth; to save sinners like you and me, to forgive us of our sin and restore the broken relationship between God and His people. Give each child a blank piece of paper provide markers or colored pencils. Encourage them to write the word forgives somewhere on the paper and then write or draw something to help them remember this attribute of God. They could write the definition for forgives or the memory verse or they could illustrate any of the passages you read about God being forgives. After a few minutes, bring the group back together and give kids time to share what they have drawn or written. Pray that the kids in your group would come to see themselves as sinners in need of forgiveness and that they would turn to Christ in faith for forgiveness and salvation. Filed Under: Lesson Plans, Luke, What is God Like?